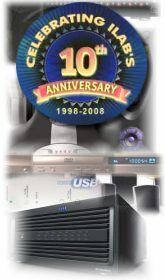 iLAB America was founded in 1998 by Wayne Boyle to develop state of the art consumer electronics products and software for the OEM/ODM market. iLAB America , pronounced "eye-lab", is short for Integration Laboratories. Our primary market is the design, development and production of audio, video and gaming products and iOS software for OEM/ODM clients. It's also common for iLAB America to develop products in advance to offer clients a "turn key" solution that can be inserted into their product lines. These "stock designs" are usually minimally changed to match the clients current product styling. We can also provide additional design services to add features to suit a clients needs. Stock designs can save clients many months of lost time to market since the bulk of the development is completed. This proactive approach to serving our clients needs demonstrates our commitment to keeping your product line advancing with evolving technology. iLAB America also offers complete concept to production solutions to deliver product designs that are tested , boxed and ready to ship to the customer. This is ideal for companies with already over-burdened production capacity. Project management and staffing are essential components of the product development and production process. We are often contracted to assist our clients throughout the entire process to assure successful production of their products. We can also assist clients seeking approvals such as UL, CUL, FCC , Dolby Laboratories and DTS and iBiquity's HD Radio. iLAB America can provide technical services within specific areas of a project or we can develop the entire product for you. Products development costs are either a fixed fee or charged on the basis of the time used. iLAB America specializes in the design and production of microcontroller and iOS software. Our focus is on control , communications, data acquisition and Audio Signal Processing. iLAB America offers turn-key product designs including schematics, bill of materials, parts sources, circuit board layout, electronic packaging and enclosure , production, and testing. We also design products from a clients concept to produce prototypes to production quantities. iLAB America offers complete production and test services through our ISO 9002 certified strategic partners. This greatly simplifies the process of reaching the market for our clients by providing a complete design to production solution through a single source.